Why Athlete’s Foot is a huge problem, and how you can rid your locker rooms of it for good! Athlete’s foot is a common fungal disease than often runs rampant in locker rooms, spreading from athlete to athlete. 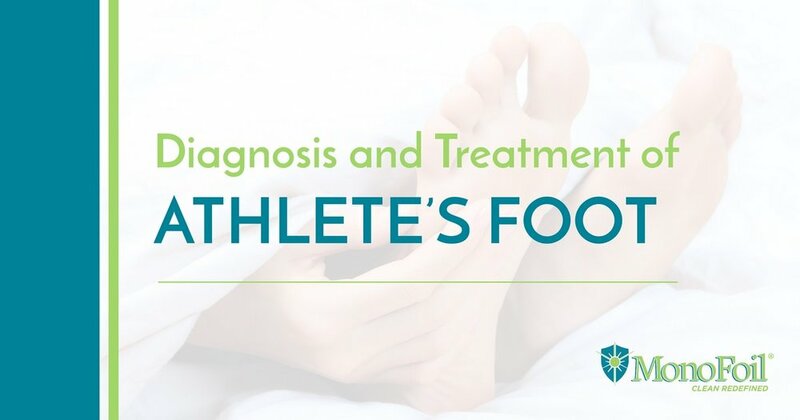 In this post we’ll look at the symptoms and treatments for athlete’s foot and how you can use MonoFoil to prevent it from spreading through your locker room. According to the National Institutes of Health, between 15 and 25 percent of Americans have athlete’s foot, no matter what time of the year. It is a fungal disease called tinea pedis, which is a form of the common fungal infection called ringworm. that spreads easily to other parts of one’s body. It can also spread to other people. This is especially true in warm, moist environments like locker rooms. Researchers estimate that 70 percent of people worldwide will have a fungal infection on their feet sometime during their lives. 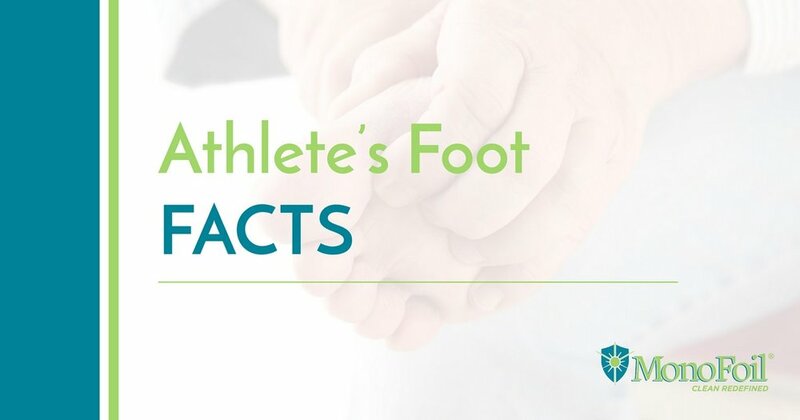 The reason tinea pedis is often referred to as athlete’s foot is that public showers and locker rooms have the perfect conditions for it to grow, so it spreads very quickly from person to person in these environments. · Males are more likely to get athlete’s foot than females. · Athlete’s foot is less likely to occur before puberty. · A compromised immune system can make you more likely to have athlete’s foot. · If you have hyperhidrosis, or the tendency to sweat in excess, your chances of getting athlete’s foot are higher. The fungus can only infect the top layer of skin. Spores of the fungus can live in the outer skin layer for up to one year. Since the spores have a long life, they can easily be passed to another person. The most common symptom is an intense itching and burning sensation. If your feet are cracked, or if bacteria invade the area, the infection may become painful. If your infection is dry, you may see white scales on your feet. They may be red or cracked, and you may have peeling between your toes. Your skin may thicken at the site of infection. If your infection is wet, you will see white, moist skin that may look wrinkled. You may also have fluid-filled blisters. A doctor will scrape a portion of the affected area and test it for the presence of tinea pedis. Often, over-the-counter topical antifungal creams or sprays will alleviate symptoms. Your doctor may prescribe stronger antifungal topical cream or oral medication for more severe cases. If a bacterial infection accompanies athlete’s foot, you will need antibiotics to treat the condition. The best environment for the growth of athlete’s foot is a warm, moist floor or wall, as found in locker rooms. The cleaner you can keep these areas, the less likely athlete’s foot is to spread between players. MonoFoil is tested and approved to kill fungi like athlete’s foot. It can stop the spread and make your locker room a safer, cleaner place. You can also prevent the spread of athlete’s foot with these easy methods. Bring your own sanitary wipes for the gym and locker room. Every bit of cleaning helps prevent the spread of fungus. Wear sandals or flip-flops in public showers. Keeping your feet from direct contact with the floor is essential for prevention. Wash and dry your feet after workouts, paying special attention to the areas between your toes. If you don’t have sandals, stand on a clean towel while you dry off and change clothes. That’s better than standing directly on the floor. Don’t share towels, socks, or shoes with other athletes. The fungus can spread through these items. Choose athletic shoes that breathe and allow sweat to wick away faster than shoes with thick material. It’s important that they aren’t too tight either. Have several pairs of shoes that you can alternate, so they dry completely between wearings. Dust your feet with antifungal powder before putting on socks or shoes. Wear synthetic socks rather than cotton socks, because they are better at wicking away moisture. Change your socks frequently, and wear sandals as often as possible to allow your feet to dry completely. Wash your uniform and workout gear as often as possible. Air out braces and pads after practices and games. Let cleats and shoes dry out between wearings. Remember to wipe out your bag with a disinfecting cleaner like MonoFoilD on a regular basis to prevent infection. MonoFoil uses an antimicrobial shield to prevent the spread of fungal infections. It creates a germ barrier that stops athlete’s foot from transferring from person to person. It is non-toxic, odorless, and hypoallergenic, perfect for the various needs of different athletes. MonoFoilD can be sprayed on shoes and gear that may carry the fungus that causes athlete’s foot. It eliminates odors and provides a clean freshness even on items that aren’t easy to clean, such as helmets. If athlete’s foot is a problem in your locker room, MonoFoil is the solution you’ve been searching for. Order it today and help your athletes enjoy playing the game without the hassle of athlete’s foot!